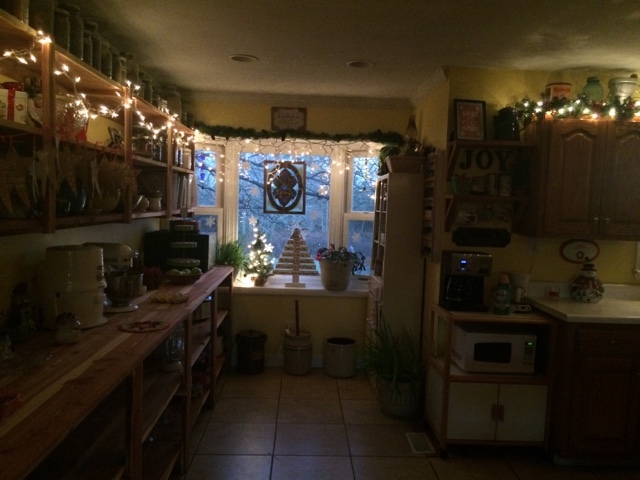 A sweet friend asked me if I would give her a tour of my Christmassy kitchen. There is nothing more I would like to do! But since she lives all the way across the country, in Oregon no less... a virtual tour will have to suffice. Welcome! I'm so glad you could come by! 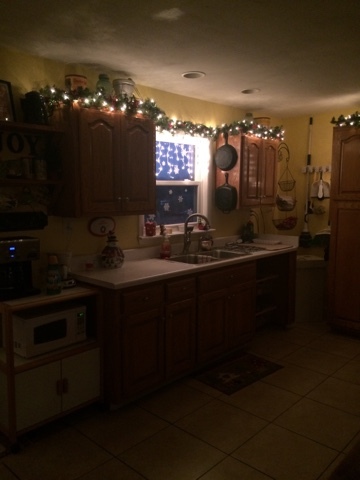 Here, let's make our way into the kitchen, it really is the heart of this home. 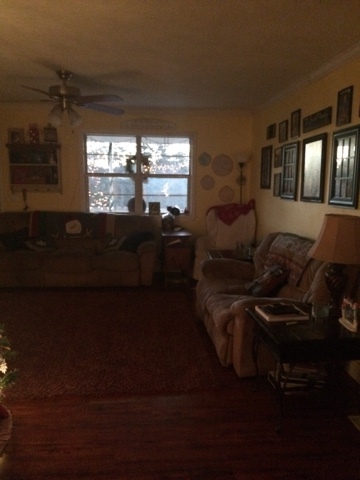 I love to visit with friends and family in there. 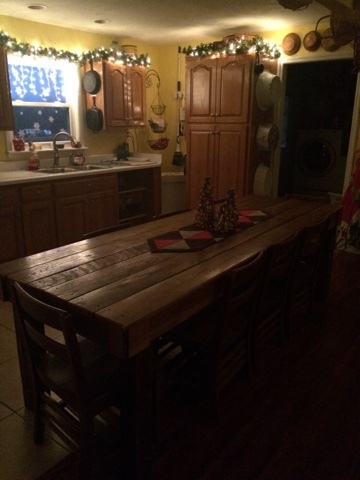 Whether we sit around the table or I scurry around making some supper or whatever, the kitchen is the place to be. As we come in, you will see my most treasured table that was made for me. 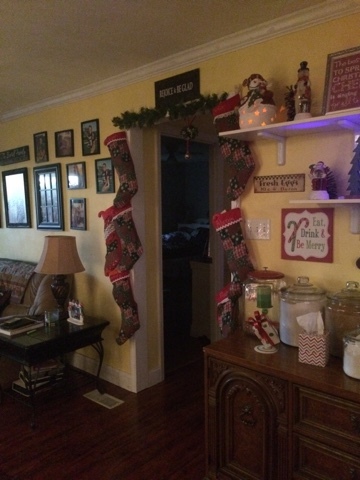 It's my most favorite thing in my whole house... aside from my precious family, of course. 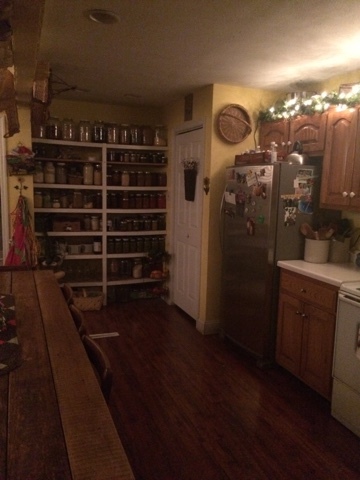 You will also see my canning pantry there on the right. 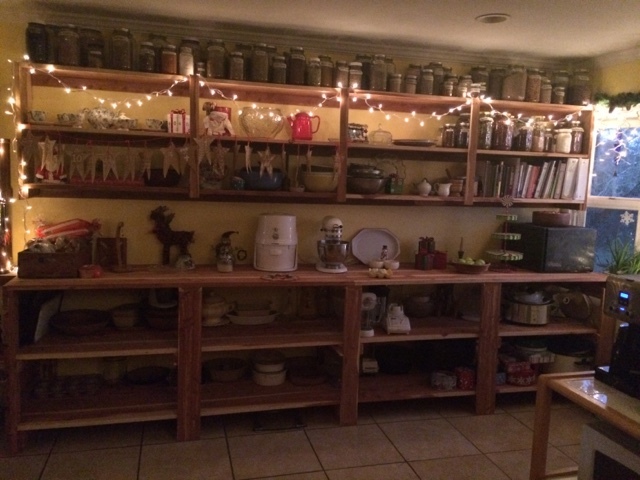 It's got jars of dry foods as well as jars of canned goods that we put by over the summer. 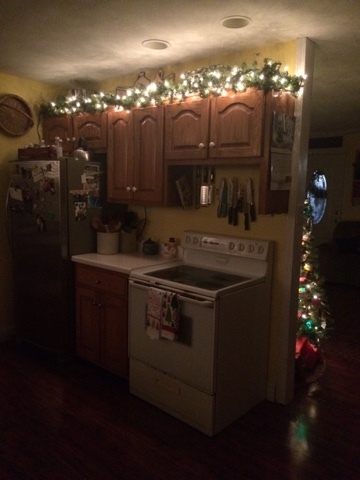 The kitchen sink and the pantry. And again my table. Cue the hallelujah chorus... that's how I feel when I see it. Also, the runner on my table comes out every Christmas season. It is a treasured gift from my dearest friend, Lindsey. 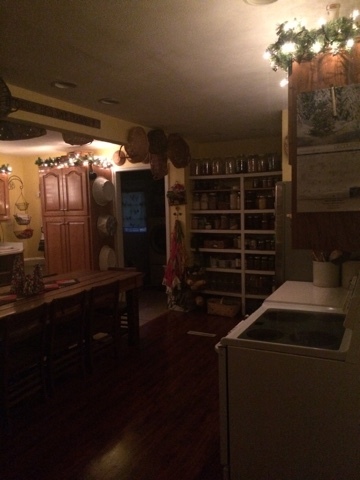 There's another view of the canning pantry. that little closet houses the hot water heater and several bulk storage buckets and all my kombucha and kefir making bottles, etc. As you turn toward your left, you will see my newest addition, it happened over the summer. One thing that I was lacking in my kitchen was storage. I'm serious. 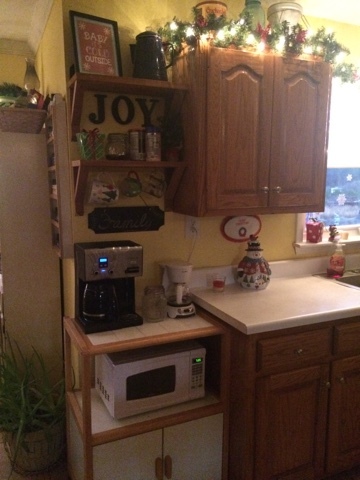 I had the cabinets you see. That's it. And for someone who spends as much time in her kitchen as I do... that's not a lot of storage to put things. Soap making supplies, herbs, cookbooks, pots, pans, bowls, mixer... you name it, it was all crammed on the very few empty spots I had in here. 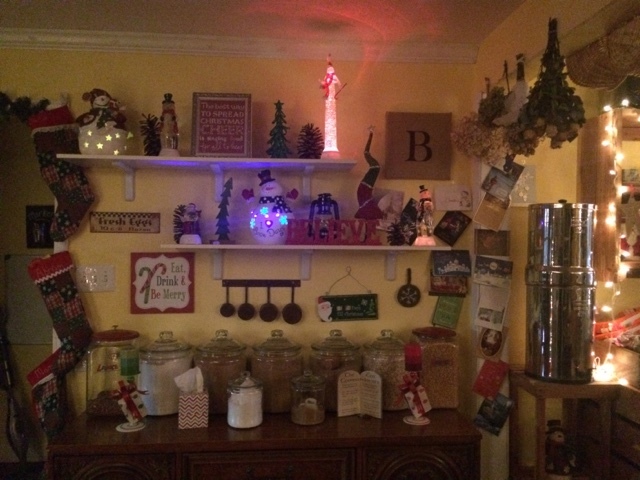 So my mom and I came up with a plan on how to make the space much more efficient and beautiful and open shelving was the answer. 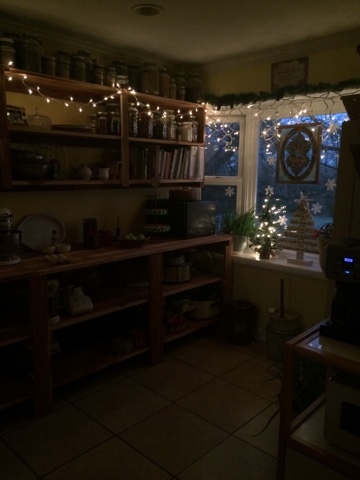 Here's a bit brighter of a shot to show you some of the jars, books, etc. This is the whole shelf. It takes up the entire wall. I can not tell you just how happy this area makes me. I sit at the foot of our table, one... because my husband is the head of our home, two... because I get this view! 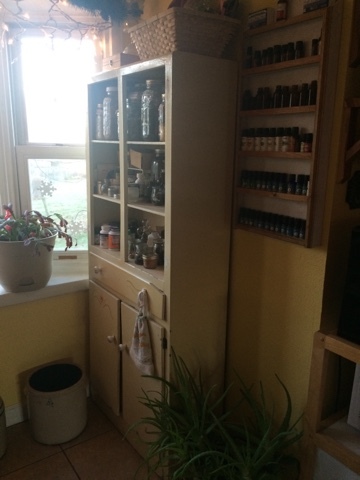 Right here is my apothecary cabinet and essential oil shelf. If you come by and are ailing from something... I may say, "I have an oil for that" or "you know, I have heard that a tincture from this and this will help that"
My kids call me a witchdoctor. It makes me laugh. This is where I keep my loose grains. I hate lugging my buckets out every time I need to grind some wheat, or when I want to make a pot of oatmeal. This solves it. Taken from an idea on one of my most favorite blogs ever, (Jewels from Eyes of Wonder, still so sad she doesn't blog anymore), I found some of these old fashioned candy jars at Walmart and housed our loose grain in them. When they get low, I pull out the buckets and refill. It works so nicely. And these are the ones I use the most anyways. There are others in smaller amounts on my canning pantry shelf. But wait! Did we miss having a cup of coffee?? Come on back and let me pour you a cup. We can't leave our visit without enjoying a nice warm hug in a mug before we are through! What? You have to go? Thank you so much for coming by and wandering through the kitchen with me. Come back again soon. We hope you enjoyed your visit. Love all your areas for specific tasks. 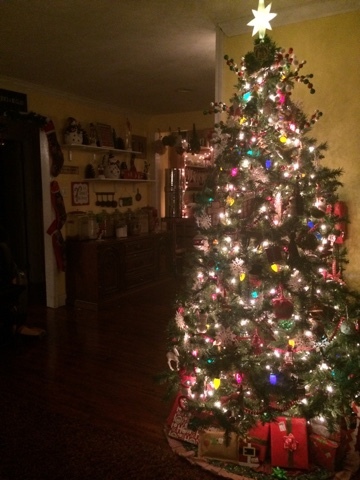 Very beautiful and soooo Christmasy! I noticed you have no curtains in your living room. It's very pretty that way. 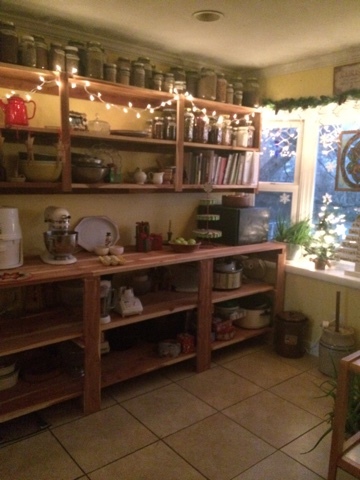 Can you share more about that wall where the open shelves are in your kitchen? How were they built? That is a terrific space; especially those pieces built especially for the room. More of a production hub than a kitchen eh. 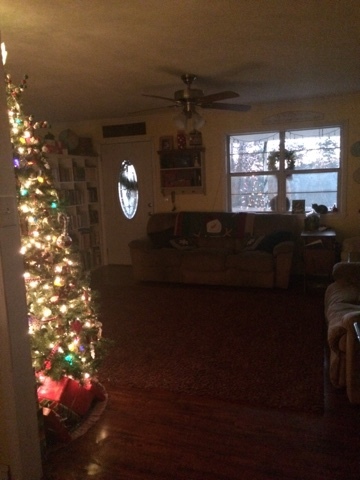 I could sit at your table and drink a cup of coffee all day...........so warm and welcome,thats what makes a home.